My small solo show opens tonight with a reception at the Anne Irwin Fine Art Gallery here in Atlanta - titled Museum Hours. This painting is one of twelve in the grouping - from the National Gallery of Art in Washington, DC, a close gathering in front of 'The Old Violin' by William Michael Harnett with 'Giant Magnolias on a Blue Velvet Cloth' by Martin Johnson Heade. A good chance to buy one of my paintings at a great price is coming up this Saturday the 28th, at the Morris & Whiteside Auction's Fine Art Collection. The event is taking place in The Red Piano Gallery, in Hilton Head, starting at 2 pm and for those who are interested in participating, but can't be there, you have several options for bidding, which I'll explain below. Here are my three paintings included in the auction. Live internet bidding is available thru Invaluable. If you prefer to place an absentee bid, please click here. 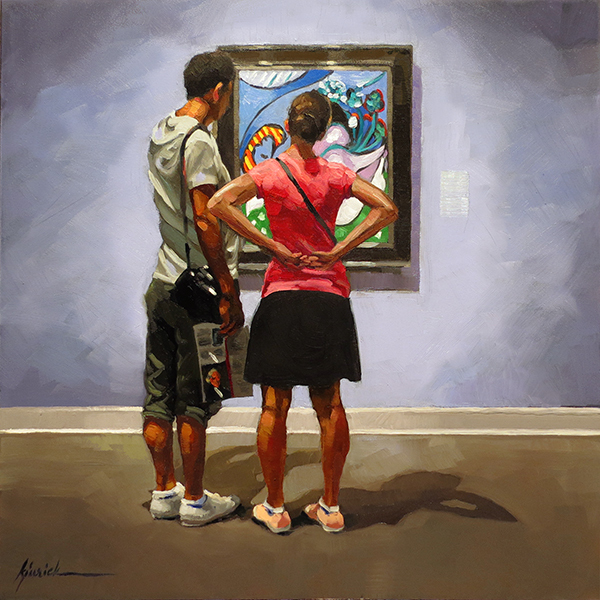 You can also arrange an absentee bid with Ben Whiteside by calling the gallery at (843) 842-4433. 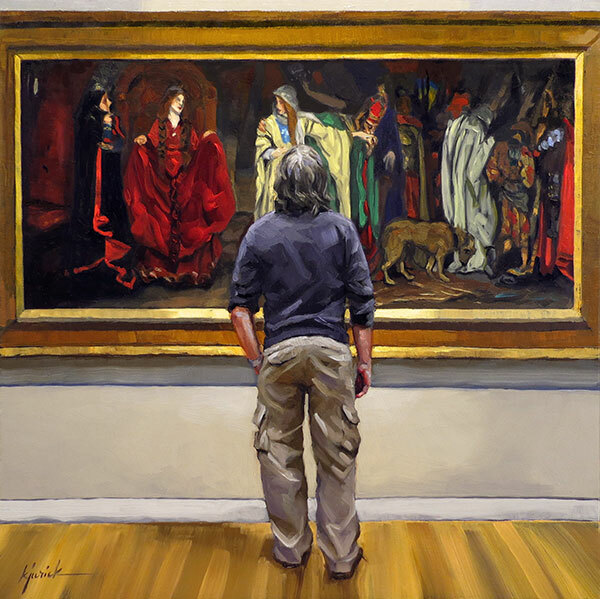 A man studying, front and center, a masterpiece by Edwin Austin Abbey titled 'King Lear: Cordelia's Farewell'. From the Metropolitan Museum of Art in New York City. 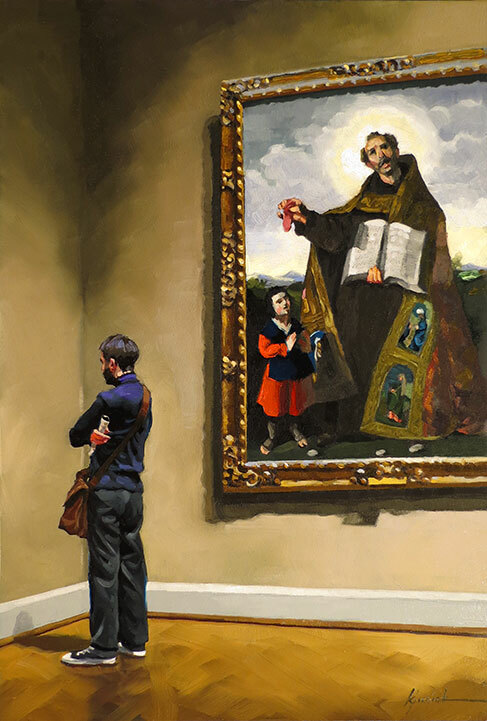 From the Art Institute of Chicago, a man stands beneath the enormous painting by Francisco de Zurbararan of 'Saint Romanus of Antioch and Saint Barulas'. To make a long story short, Saint Romanus was a Syrian Martyr, arrested for his denouncing of idol-worshipping and called on to follow Christ. The governor of Antioch, after arresting and torturing the Saint and attempting to kill him by a public burning (a sudden gust of rain extinguished the fire), he then gave orders to cut out his tongue. 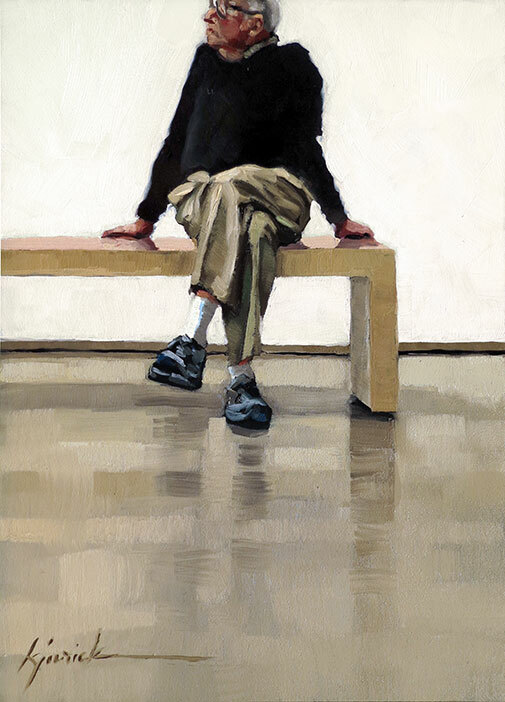 You may remember a small study I painted of this young woman. 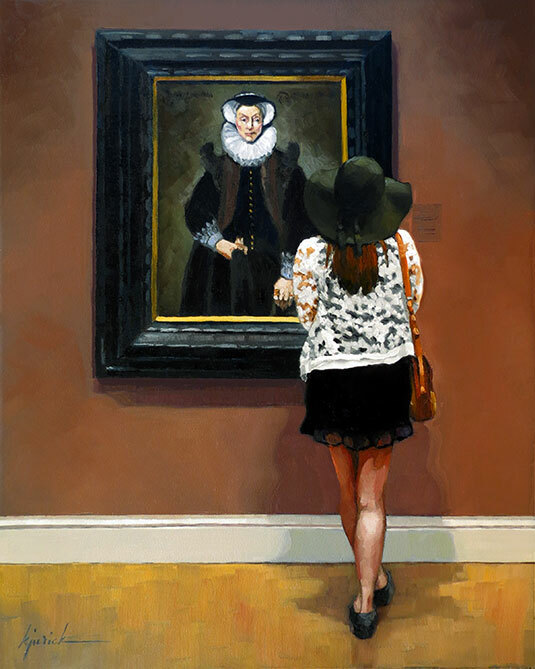 As a larger piece, I zoomed in on the fabulous 'Portrait of a Lady' by Frans Pourbus the Younger because I l-u-r-v-e this painting and I preferred the woman's back side that shows more of her feminine sweater and skirt - a contrast to the sternly dressed woman in the painting she's viewing. From the Legion of Honor in San Francisco. 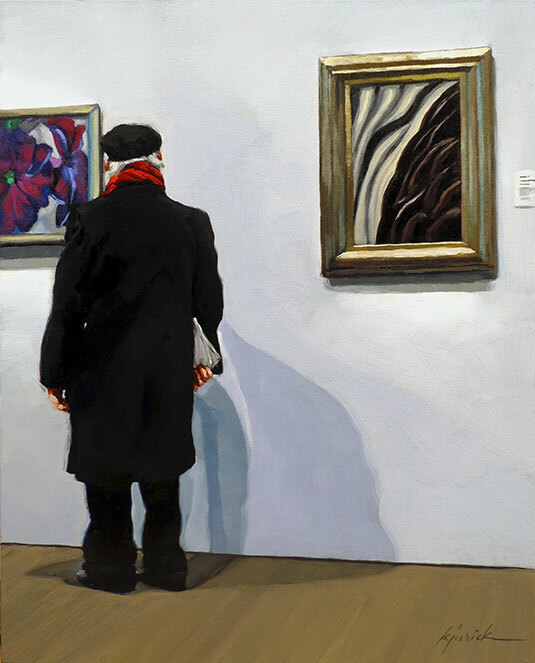 A gentleman viewing Georgia O'Keeffe's 'Petunias' with Arthur Dove's 'Sea Gull Motive' to his right. From the de Young Museum in San Francisco. 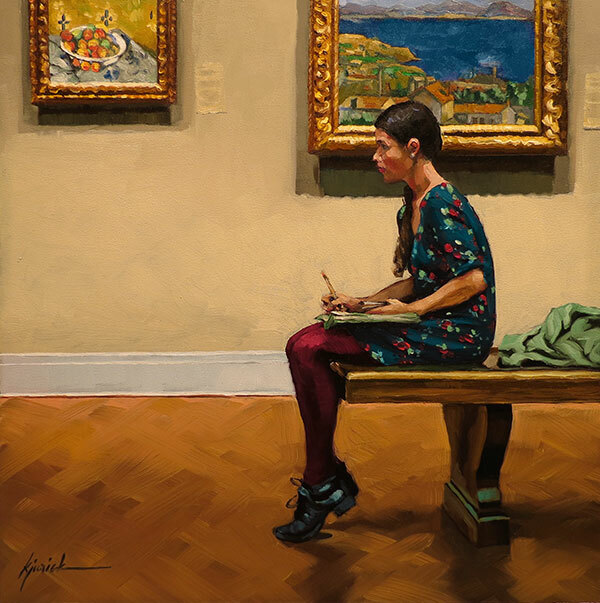 "An Artist on the Side"
Included in the small grouping for my upcoming show Museum Hours - a young woman sketching on a bench with Cezanne's 'The Plate of Apples' and 'The Bay of Marseilles, Seen From L'Estaque' behind her. From the Art Institute of Chicago. This new painting is included in my upcoming show Museum Hours - a security guard studying Asher Durand's landscape 'Dover Plains, Dutchess County, New York' in the Smithsonian Museum of American Art. 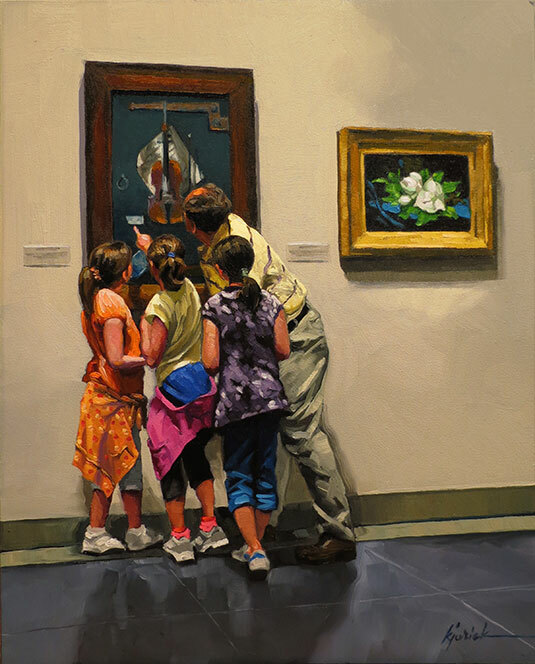 I always mention this, if you're touring Washington, DC, you must go a few blocks away from the 'Mall' area (National Gallery of Art, Space Museum, etc.) and browse this fabulous museum as well as the National Portrait Museum. And for a suggestion of GoodTV - stream in the Australian (original version) of The Slap. It's grittier and more interesting than the American version running on NBC. In the Art Institute of Chicago, in the New Modern Wing, visitors sit on long benches against a white wall. I've said this before, it's one of my favorite spots to people watch. Figures become forms against the stark background - I just love that. From the Art Institute, a gentleman rests on the bench in the lobby of the New Modern Wing. 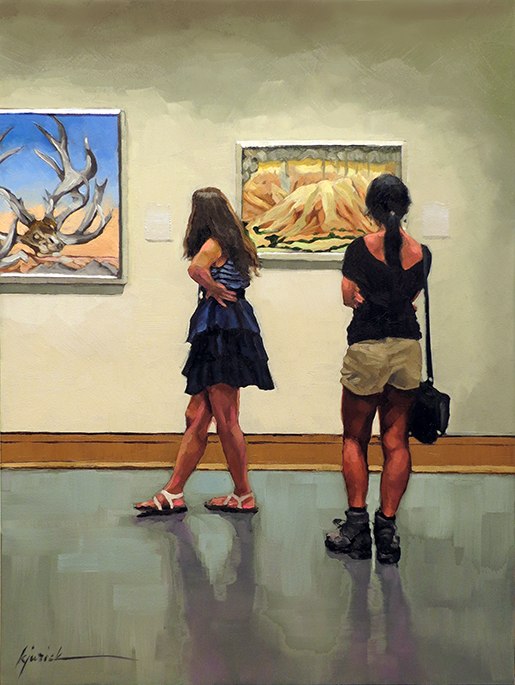 A new painting, done from a visit to the Delaware Art Museum several years ago. I was in the area to explore Chadd's Ford, the Wyeth's hometown and a place that my mom favored for inspiration when we lived in Bucks County years ago. Seeing N.C. Wyeth's and Howard Pyle's paintings as a young girl was the beginning of my desire to be an illustrator when I grew up. 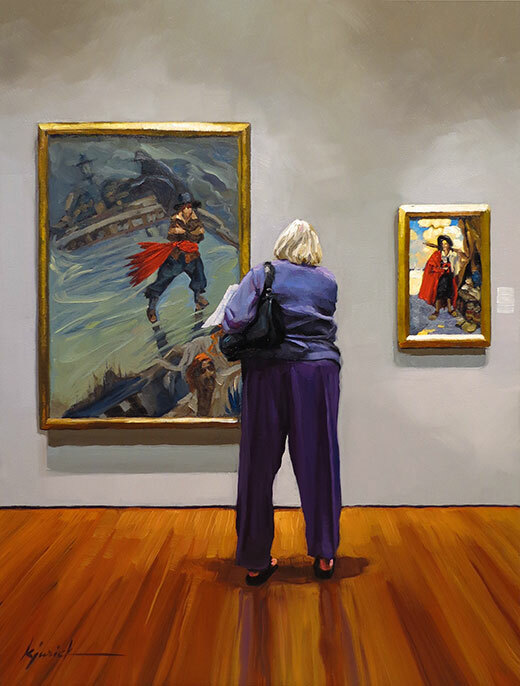 And there they were, in the Delaware Art Museum, ready to inspire me again next to a woman, with her commanding figure, enjoying Howard Pyle's 'The Flying Dutchman' on the left and 'The Buccaneer Was a Picturesque Fellow' to her right. 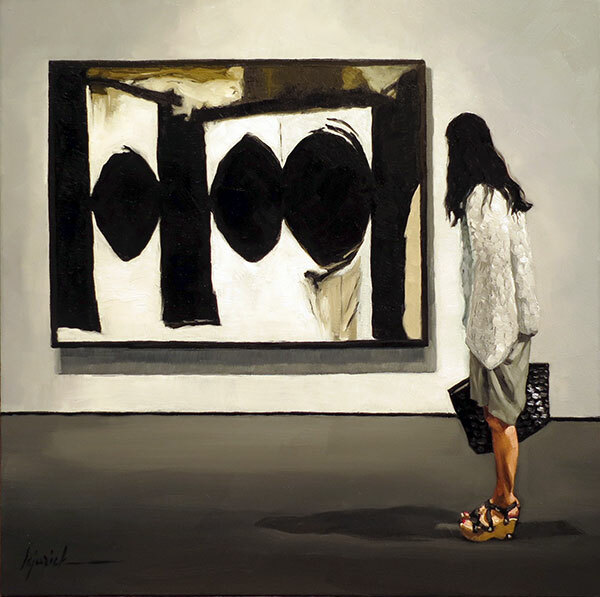 A new painting included in the grouping Museum Hours - one of my personal favorites - a woman standing before Robert Motherwell's 'Elegy to the Spanish Republic, 54", in the Museum of Modern Art, New York City. I admit, I sway more towards representational art but any time I approach an abstract painting by Motherwell, Franz Kline, Robert Diebenkorn or Mark Rothko, to name a few - I stop and stare for a good while. With Motherwell and Kline, it's the largeness, the stark forms of black and white maybe that grabs my attention. I don't strive to 'understand' it, I just enjoy it. As you may know, I will have a small solo show titled 'Museum Hours', opening February 28th at the Anne Irwin Fine Art Gallery here in Atlanta. 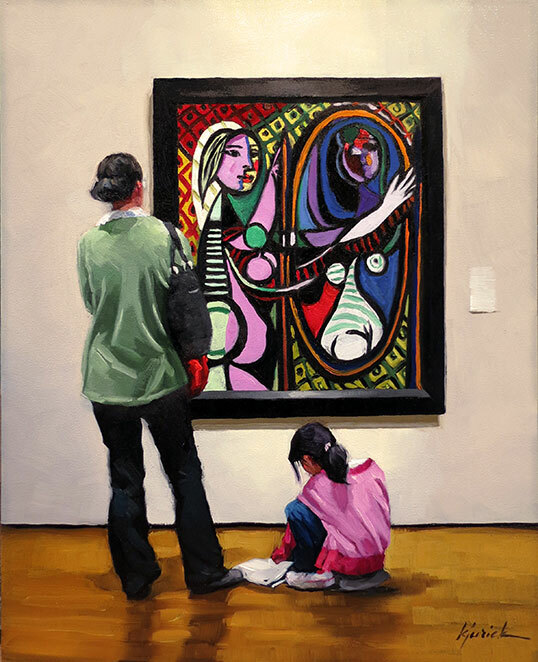 I got the okay to begin revealing the paintings, starting with this new piece, from the Museum of Modern Art in New York City - a mother viewing Pablo Picasso's 'Girl Before a Mirror' while her seemingly bored daughter sits beside her. 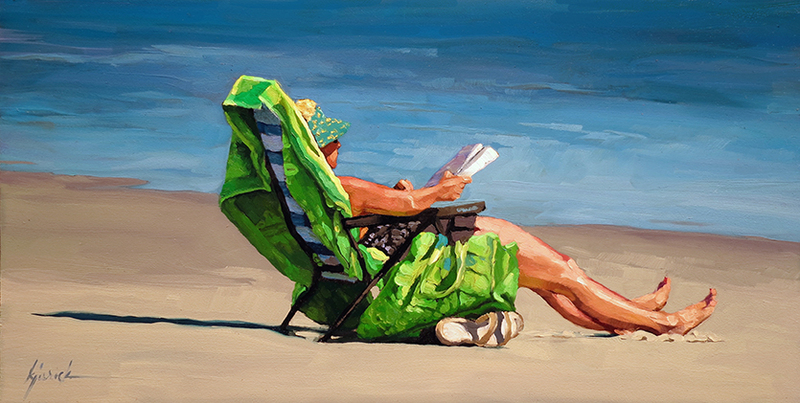 I'll admit I've been in shorts and a T-shirt today, but there are those of you who would appreciate this new painting while you finish shoveling snow. 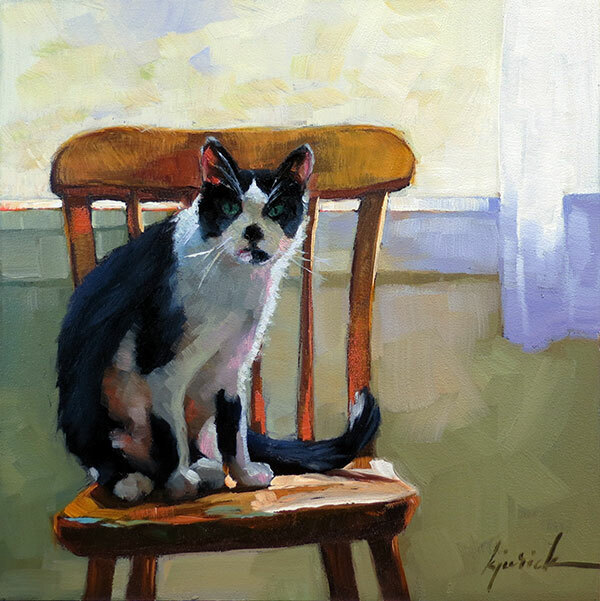 And now for something completely different - my good friends, Karen and Neil Hollingsworth's beloved cat, Maxy. And for some GoodTV ... for those stuck inside with nothing to watch, stream in these two movies this weekend - Chef and Bernie. I promise, you'll love these movies.